In 1834, Thomas Whelpley, a Cleveland artist, published a set of four prints illustrating the city. (The drawings used to make them were made in 1833.) These form the first visual record that we have of the Cleveland landscape as a whole - prior to this point, we have only maps and illustrations of individual structures. I've wanted to do a story using Whelpley's images for a while, but have had trouble locating quality reproductions to work from. The images used here are from originals in the collections of the Cleveland Public Library. They escaped my notice because they are in the art collection - be sure to check it out for plenty of other interesting material. The prints were hand-colored, with watercolor paints, probably at the time of publication or soon after. I have taken the liberty of removing the rather large margins and adjusting the exposure, in the interest of clarity. 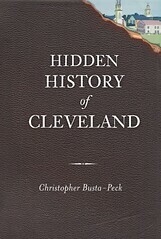 The population of Cleveland, as of the 1830 US Census, was 1075. Cuyahoga County as a whole was just above 10,000. The Ohio and Erie Canal had just been completed, drastically reducing the cost of shipping goods. It would bring down the cost of goods dramatically. Cleveland was on the verge of major change when Mr. Whelpley made these images - that there was demand for such a portfolio may be seen as one indicator of that. In this view of Cleveland, From Brooklyn Hill Looking East, we see a small town with a prospering waterfront. Many ships are docked along or transiting the Cuyahoga River. While this is clearly an area of some commercial significance, it is still rural enough that cows and sheep are grazing in the foreground. In From the corner of Bank and St. Clair Streets looking east we see some of the most notable buildings of the city at that time. Bank Street is now West 6th. About a third of the way from the left, the building with the tower is the Academy, the only school in Cleveland, built 1821-1822. It replaced a small log structure built a few years earlier. To the right, we see two churches. To the left is Trinity Church, built 1828-1829. To the right, the Presbyterian Church. 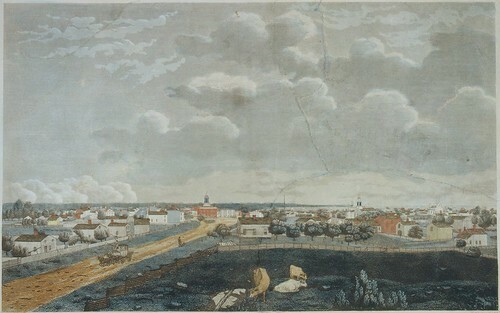 At the far right, in the distance, is the second Court House, built 1828. The various buildings are also tagged directly on the image in Flickr, if you have difficulty locating them. The Court House was located in the southeast quadrant of Public Square. In From the Court House looking west, we can see Superior Avenue, the main business route at the time. Even so, it still has many residential structures, most of which were built of wood. Some show Greek Revival elements, while some, presumably older, bear Federal traits. In the distance, to the right, we can see Trinity Church. Past that, Lake Erie is visible. From the Buffalo Road, East of the Court House shows a point on what has become Euclid Avenue, looking west from about East 9th Street. 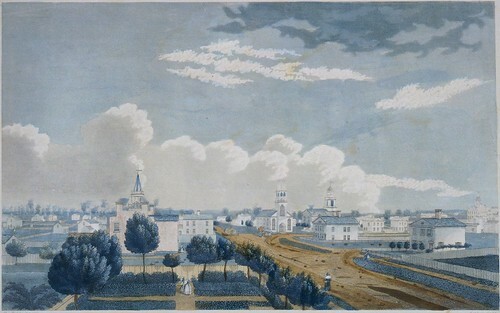 Euclid Avenue runs from the left corner toward the center of the image and the Second Court House, built in 1828. The court house was not just a legal center, but also served as a gathering place. A third of the way from the right, in the distance, we can see the two churches noted previously. In the foreground, there is a large pasture, with cows grazing. For more information, see Cleveland: Village to Metropolis by Edmund H. Chapman and Cleveland: the Making of a City by William Ganson Rose. These images show a city that still bears much of the form of a New England village. 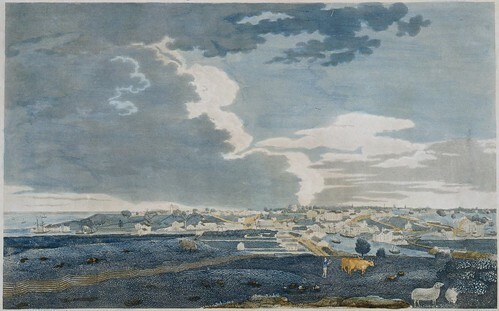 Animals still grazed near the center of the city, and the economy was still largely agricultural. Every building shown here is gone. 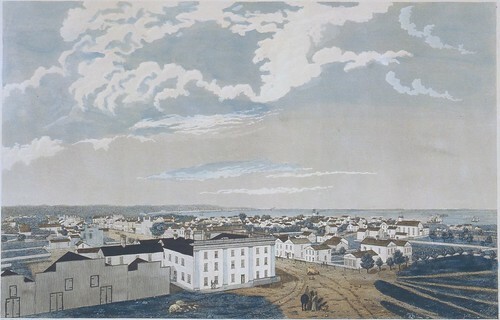 Even so, it's worth looking at the city as it was, 177 years ago. Up to the point of the building of the interstate highways, the city retained much of the same basic layout that was used here. These images, I hope, can show a bit of the intention behind the roads that make up our downtown. Please be sure to click through to the high resolution versions to examine them in detail. Above the cow on the left, I can see my family's homestead. Wonderful to see such high quality versions. I have these 4 prints (2 290/500 and 2 296/500) Am going to sell them if anyone is interested.